Home > News > News > TONIGHT – It’s Southside Johnny and The Asbury Jukes! TONIGHT – It’s Southside Johnny and The Asbury Jukes! “There’s one thing I’ve always wanted to do,” Southside Johnny confesses, “and that is to sing.” He has been doing just that for over a third of a century. 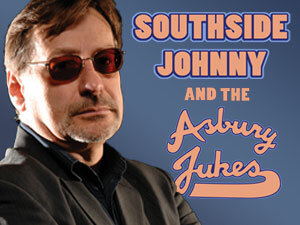 An exuberant rhythm and blues feel is Southside Johnny and The Asbury Jukes’ trademark. The driving sound of their legendary horn section transports the band to their classic, jubilant, “let’s play all night” mood. Over the years, Southside Johnny (so nicknamed because of his bent toward the Blues sounds of the Southside of Chicago,) played in a number of blues and R&B bands, often joined by pals Bruce Springsteen, “Miami Steve” Van Zandt, and Garry Tallent. “I’ll stack my group against any group out there. We enjoy playing, and the audience enjoys having a good time. Music is a shared emotion. We distill it down to that,” Johnny said. When you distill Southside Johnny and The Asbury Jukes, you come down to 35 years of great music and good times. Southside Johnny and The Asbury Jukes – Friday, February 24 at 8:00 p.m. – Click here to purchase tickets now!